The success of a new production of such a popular classic must depend on presenting it in a fresh new way while retaining the very essence of what proved to be its enduring appeal. Cameron has put together a creative team and performers who can deliver exactly that. 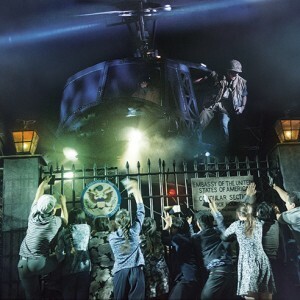 The new staging, by Totie Driver and Matt Kinley, works extraordinarily well, realistically portraying the exotic locations of Saigon and Bangkok. The Engineer’s bar, Dreamland, is expanded favourably with the use of multi level structures. Although I would certainly prefer Kim’s room to be centrally staged, as sidelining it does diminish what happens there and leaves the beautiful ‘Sun and Moon’ to be sung on the steps. 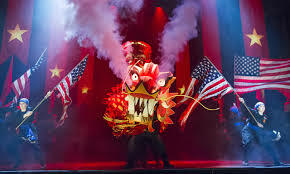 ‘The Morning Of The Dragon’ is a triumph of staging and choreography (Bob Avian) with superb acrobatics and a gorgeous, red, fire-breathing Chinese dragon. This spectacular scene is topped only by the arrival of the helicopter in the Embassy evacuation. The realism of this for the audience is enhanced not only by the throbbing sounds but also by the swirling updraft which can be felt as the helicopter comes into lands. A massive projection shows the helicopter fly in, turn and prepare to land but as it does the projection parts to reveal an actual helicopter behind. There are a few lyric changes and a new song for Ellen ‘Maybe’, which has a hauntingly beautiful melody and lyrics (Boublil/Mahler) that show a more vulnerable, softer side to Ellen. What strikes you afresh though is the amazingly powerful quality of Schonberg’s storytelling music which insistently drives the action forward. It’s not just the marvellously melodic songs but also the recitative with its big, bouncy speech rhythms. Recitative is one of the hardest things to get right in a through sung musical as it can so easily be boringly banal or lacking in credibility. But Schönberg’s recitative, combined with the Boublil/Maltby rhymes that really land, ensure that snatches of it stay in the mind long after the show ends. Eva Noblezada, an unknown 18 year old, gives an astonishing performance as Kim. She balances the vulnerability and feisty, grim determination that the role requires with supreme confidence while singing her heart out. It’s almost impossible to believe that it’s her first professional role. She is well matched by Alistair Brammer’s convincing Chris. Hugh Maynard as John and Tamsin Carroll as Ellen play excellent supporting roles. 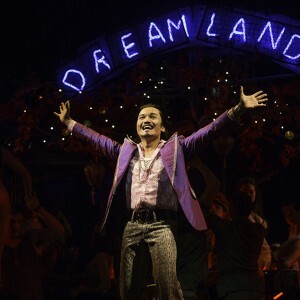 Kwang-Ho Hong is a revelation as Thuy with truly remarkable stage presence and a wonderful voice. Jon Jon Briones as the magnetically devious Engineer is superb in a role he seems born to play. Laurence Connor’s slick direction and cinematic staging grabs hold of our attention so that we feel every grain of suspense and totally engage emotionally with the piece. This is a visually stunning, exciting production that will not disappoint and is likely to continue to break hearts for many years to come. See also opening night photos in News.